French Early Victorian antique parure brooch earrings bracelet enameled gold: Description by Adin Antique Jewelry. 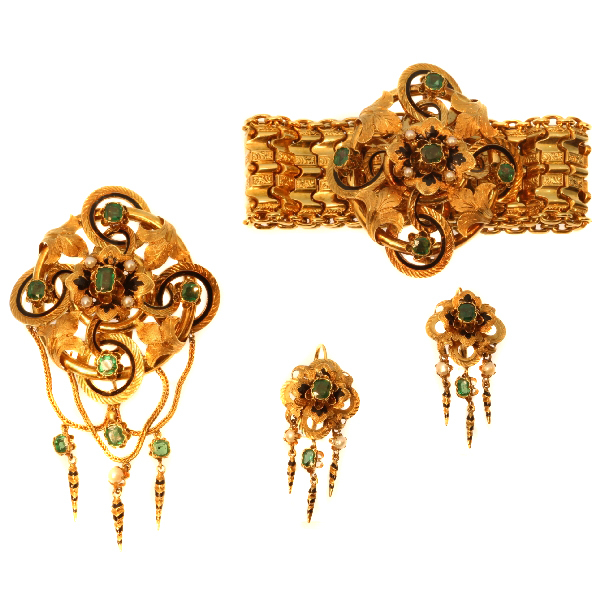 Here we have an opulent Victorian parure consisting of an 18K red gold bracelet, brooch and earrings with touches of black enamel. A parure is a term of the trade for a matching set of jewellery, meant to be worn together. As is typical for jewellery dating back to 1840, this parure is marked with a Neo-Gothic quatrefoil. Four lobes of engraved links with a black enamelled centre reach with a smaller one for the piece's middle flower with a Strass stone as its heart and with four petals embellished with black enamel and pearls in between. Sprouting from each link, an engraved leaf grows from an outer ring to a smaller inner ring, which carry each element of riches. This floral arrangement is the centrepiece of the parure's bracelet with extensive waving plates linked by a cable chain on both sides. Also the brooch is embodied by the same myriad of flowers, crescents and stones, but additionally suspending three foxtail chains with another three green Strass stones, a pearl and three enamelled prongs. The pair of earrings presents the simplified image of the brooch. Next to the fact that this parure is a lavish flower bed of which no part is left untouched by the elaborations of engravings and enamelling, this treasure is complete with its original jewellery box. Country of origin: This can be of French of Belgian origin because the hallmark used, a horse head, was used in both countries. Birthstones: Emerald is the birthstone (or month stone) for May and pearl for June. Hallmarks: The control mark here represents a horse’s head and was in use in Belgium from 1831 and in France from about 1838.